• The boat departs at 9 am from the port of Zakynthos and returns at 6 in the afternoon. • The trip takes about 9 hours. 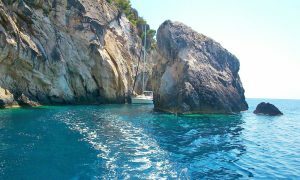 • When the boat departs, it heads for the caves of Keri, sailing past Vassilikos coast and the islands of Pelouzo and Marathonissi. • In the caves of Keri, the passengers can dive and enjoy the scenery but also see the sea bottom with a mask, as long as they want to. • After the caves of Keri, the boat will drop anchor on the beach of the village. Passengers can have a meal in a traditional tavern, walk on the beach or do some shopping. 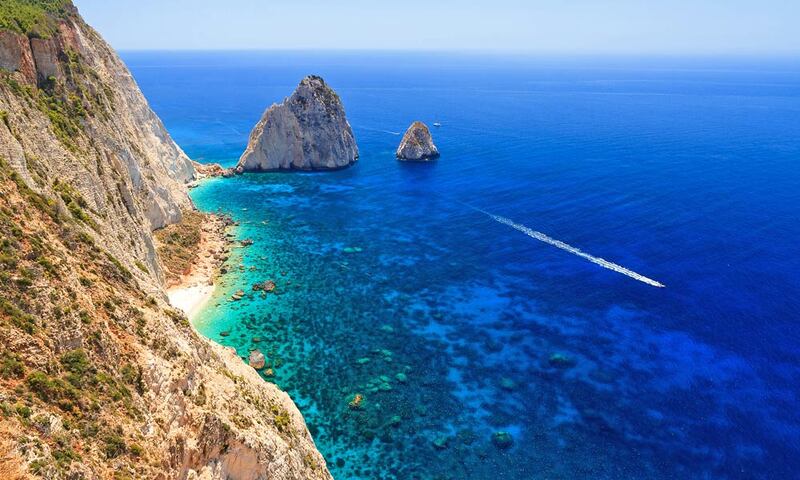 • While returning to the port of Zakynthos, the boat will sail past the wonderful beaches of Vassilikos again. • Turtles usually accompany the boat and offer many photographic snapshots. • The passengers can choose to swim either on crowded beaches or in isolated ones, as well as to stay longer in a place, of course after agreement with the captain. • The captain will examine every customer request and fulfil it, depending on the weather and travel conditions. • There is always the customer’s choice, if they wish, to be transported from their place of residence with a luxury vehicle (different charge applies). Otherwise, an appointment is made at the main port of the town of Zakynthos. 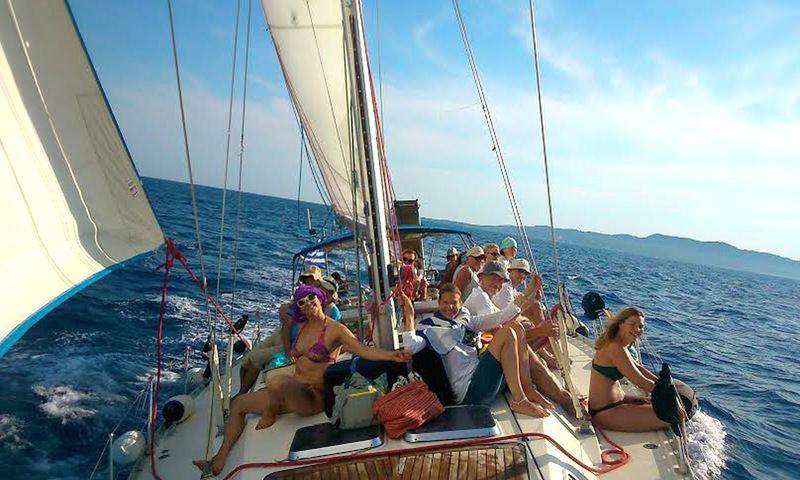 • The experienced crew of the boat will welcome and serve you, taking care of your spending unforgettable moments. • If the passenger wishes something else that is not mentioned in the program of the trip, they may ask the captain, who will take the conditions and weather into consideration, to decide whether he can fulfil the customer’s request. 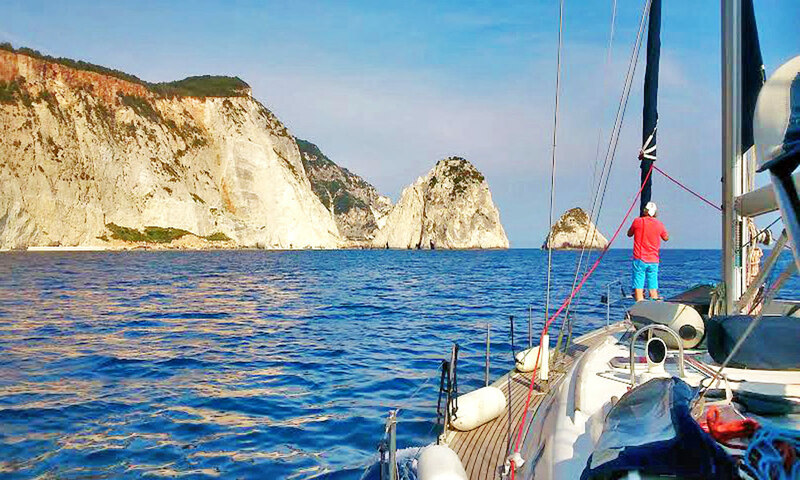 Have an unforgettable tour with one of the sailing boats of our company in the area of the National Marine Park of Zakynthos, where the turtle Caretta caretta lays her eggs and breeds every year, making a trip of miles from the other end of the earth to the coasts of Zakynthos. Departure will take place early in the morning, at 9 o'clock, from the main port of the island, with the customer’s choice to have a pick-up from their place of residence with a luxury vehicle. 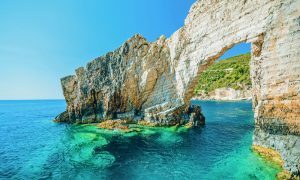 From the port of Zakynthos, the boat will sail to the caves of Keri on the southeastern side, along with the lush, beautiful coasts of Vassilikos. Sandy creeks with lush vegetation make up a wonderful scenery, looking like a painting. 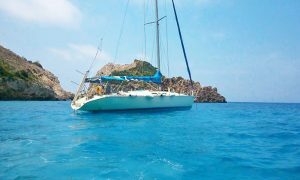 Sailing past the cape of Gerakas, with the beautiful beach which is the place where caretta-caretta turtle lays her eggs, the boat is heading for Keri. On the way, passengers will see the small islands of Pelouzo and Marathonisi, in the bay of Laganas, which is also a national marine park. 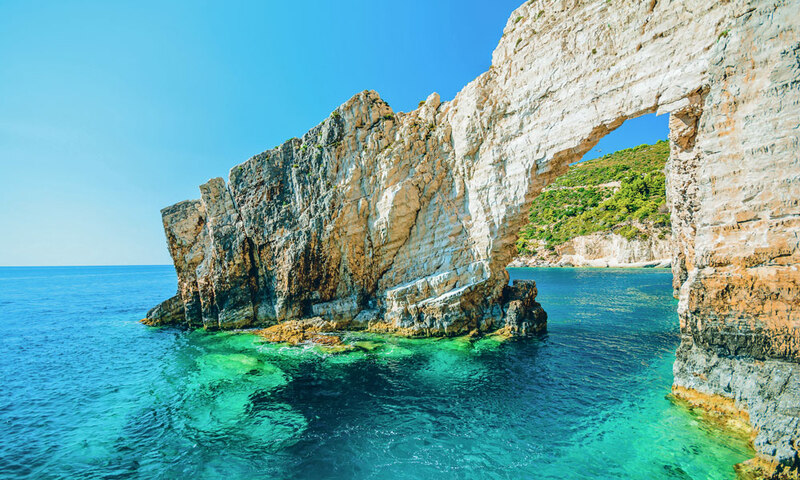 As soon as the boat reaches the caves of Keri, it will drop anchor and the passengers can enjoy the crystal clear waters under the green rocks. Diving with a mask and snorkel and observing the wonderful bottom will fascinate the swimmers. After the passengers have enjoyed the sea and the sun, the company will return to the boat that will sail to the creek of the small fishing village of Keri. There, the passengers can enjoy their meal in a picturesque fish taverna, but also take a stroll or do some shopping on the beach of the village. Once the visit to the seaside village of Keri is completed, the boat will sail close to Marathonissi. The island has a turtle shape and is a nesting area of the Caretta caretta turtle. If circumstances allow, the passengers will meet some turtles swimming quietly away from the dozens of boats which go after them trying to take photographs. 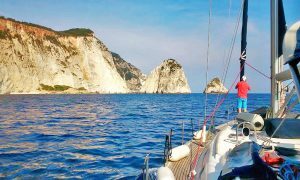 Then, ally with the wind, the boat will return to Zakynthos port at about 6 pm, after sailing past the coast of Vasilikos again. 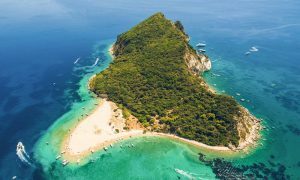 If there is time and good weather conditions, the passengers may choose to dive in a secluded beach enjoying the clear sea of the Ionian Sea. 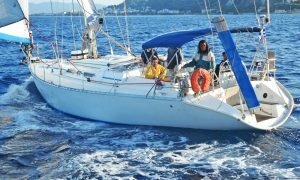 Of course, if the passengers would like to, they can participate in the sailing experience, assisting the crew in lifting sails and taking part in the whole process. It is an experience that will be unforgettable to them. • Trips take place with sailing boats. • The boats have cabins (depending on size), toilets and showers. • Do not forget to take extra clothes, sunscreen and a hat. 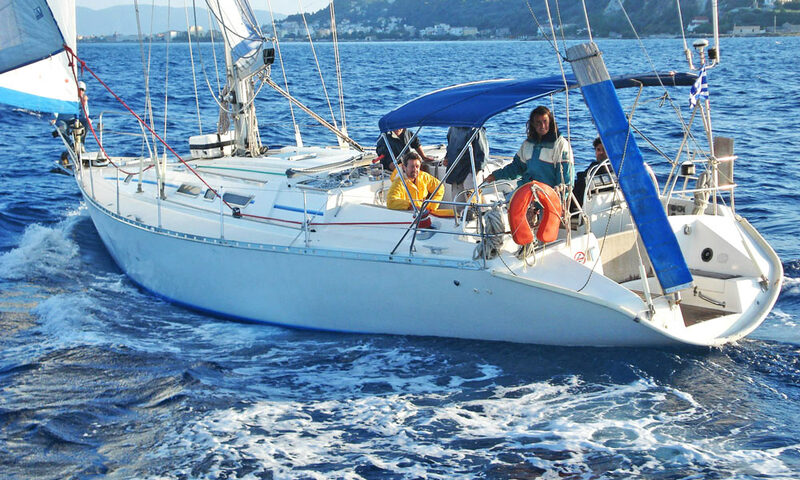 • The crew of the boats are experienced and certified adequately. • The departure is about 9 am and the return is about 6 pm. • Water, fruit and refreshments will be provided to the passengers.